Gareth Saunders and his wife Jane had a challenge. Two of them, named Reuben and Joshua. As Gareth described things in an email, when the twins were born, the couple used Double Duty, a “care diary” where parents can track feedings, medication, and so on. What’s the accomplishment? Twins who are fed on schedule with the desired amount of formula. Who are the performers? Mainly Gareth and Jane, the parents, though sometimes the task was delegated to, let’s say, temporary staff. Sometimes you need more than one job aid. The parents were trying to accomplish a number of different tasks, and some, like the feedings, occur many times a day. High frequency is usually an argument against using a job aid. In this circumstance, though, the on-the-job environment, with its conflicting demands, divided attention, and fatigue, hindered success. Which means a checklist, a job aid to support accuracy and completeness, made a lot of sense. You can see the care diary at the top of the photo. Gareth and Jane already had this type of job aid–a worksheet–to guide their child care. Worksheets help you collect pertinent information to support a subsequent action or to provide a record of what you’d been doing. The baby-feeding cycle and its “performance requirements,” however, meant that sometimes the worksheet just didn’t get completed. The couple began using the ready-to-fill bottles, arranged on Gareth’s homemade forms, as a three-dimensional checklist. In other words, the checklist made it possible for “untrained workers” to produce the accomplishment (babies fed proper amounts according to schedule) while maintaining the used-bottle audit trail. The parents were already using a job aid but found they weren’t always accomplishing their goal. In other words, they saw the need for improvement and set out to achieve that. 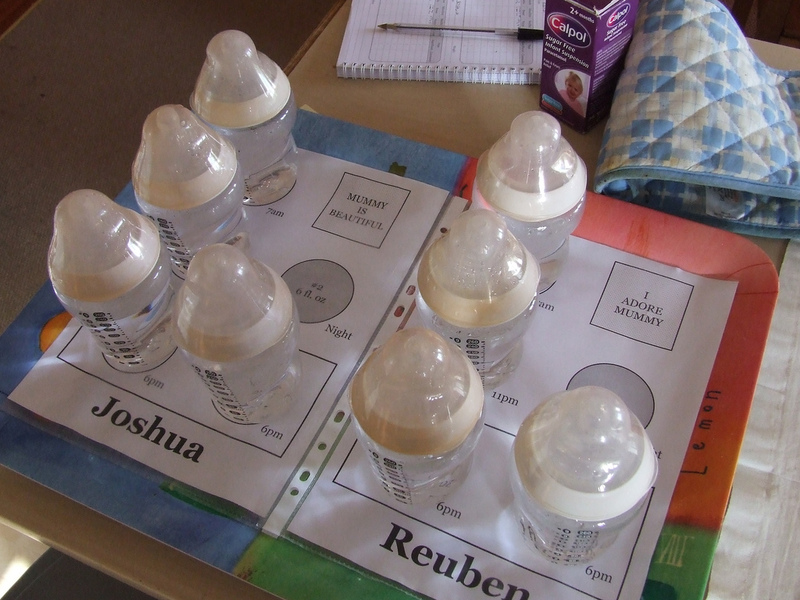 On-the-job testing led to further changes, like indicators for the amounts for each bottle, a space for an extra feeding, and an area with a different shape for medication. Over eight months, the couple produced six versions of the checklist to match job requirements (the amounts and the number of feedings changes as the twins got older). I’m especially grateful to Gareth, who is an information architect at the University of St. Andrews, for permission to share his photo and the background information he so cheerfully provided.